Europe’s first 100% electric ferry, developed by Ærø Municipality, helps define the future of carbon-neutral waterborne transport. Ærø Municipality is in the process of developing Ellen: a 100% electric power-driven, energy-efficient and emission-free ferry. 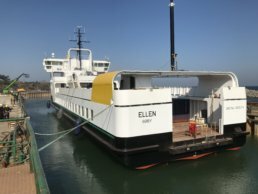 Ellen will not only replace the conventional ferry between Ærø and Funen, but will pave the way for CO2-neutral, pollution-free and energy-efficient waterborne transport worldwide. The idea for the ferry came from local citizens; today, it is shaping the development of a whole new ferry prototype. The ferry has an newly developed battery system which has received type approval, and which allows it to sail seven times longer per charge than other electric ferries across the world. With its uniquely developed battery system with type approval, Ellen will be able to sail seven times longer on one charge than existing electric ferries. On Ærø, six wind turbines produce 125% on average of the island’s annual electricity consumption. This production leaves plenty of surplus energy on which Ellen will be able to run in the future. In periods of inadequate surplus energy, rather than sailing on a diesel powered emergency generator, Ellen will instead boast a 100% electric emergency generator, making it the first ferry of its kind in the world to achieve absolute carbon neutrality. An emission-free ferry with no air pollution will lead to annual reductions of 41,400 kg NOx, improving health and well-being for passengers, crew and local residents. The E-ferry is an innovation project on which a number of industrial partners have collaborated to design a 100% electric ferry, sailing longer than has ever been seen in E-ferry services. On Ærø, residents depend on ferry transport to get to and from the island. Sustainable infrastructure, like Ellen, will ensure the connection to the mainland in the future. Ærø Municipality occupies the 88 km island of Ærø in southern Denmark. 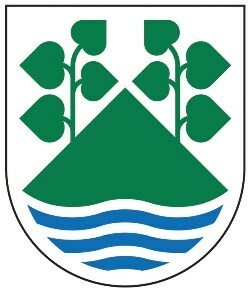 The municipality belongs to Region of Southern Denmark.